I added 26 pictures from the Book of Ruins project today. This was a project to research and photograph historic ruins and ghost towns across Michigan. I worked on this project for about three years, travelling all over the state, wandering through the woods, backroads, and all kinds of odd places. Many of the towns featured in this project were old mining towns, located along the railroad, or were used for lumbering. When the mines or lumber died out, the towns did as well. Most of these towns have been reduced to nothing, leaving barely a trace of their existance - usually just a foundation or two. Others, such as Marlborough, are vast and dangerously unstable ruins, lost deep in the woods. Finding these towns were often a challenge. Many of them were listed on old railroad maps, which lack detail and are sometimes hand drawn, and out of proportion with the actual landscape. As a result, the exact location of these towns was not recorded, and no present information could be found. The most useful tool for finding these towns was satellite imagery, which allowed me to trace the scars of the old railroad grades to a point where the towns should have existed. From that point, it was a matter of hiking through the woods, or following the old grade to those locations. Sometimes we would find the remains of the town. Other times, there would be nothing left (and thus, nothing to photograph). The majority of the images posted were shot on infrared film, which produces some interesting effects. 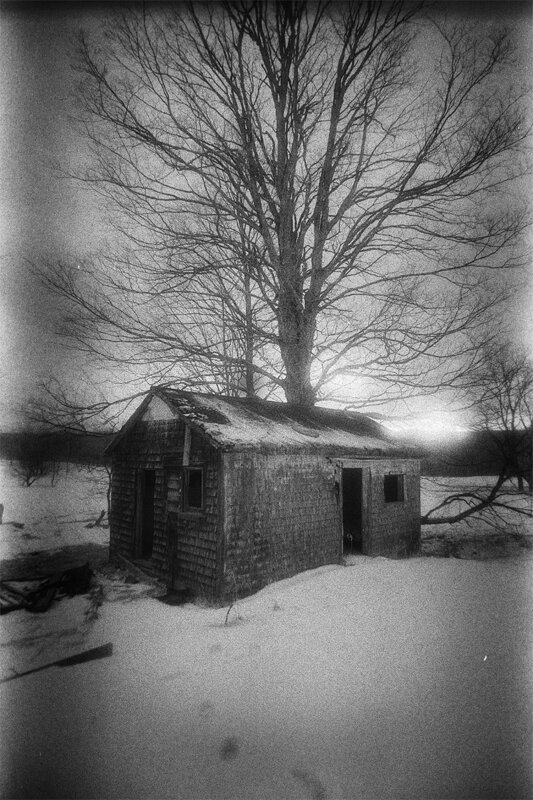 Trees will appear white in color, the sky often appears much darker, and the grain of the film is often much more pronounced. There were always some challenges when shooting on this type of film, as it focuses differently due to the infrared wavelength being longer than visible light, and it's also not possible to meter for exposure, so there was a lot of bracketing and a bit of luck involved. I have quite a few more rolls of film to go through, so I will be posting more images from this series soon.